By LPDAdmin in Reviews on July 13, 2012 . 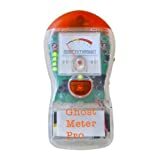 Technology Alternatives Ghost Meter Pro EMF Sensor with 4-Modes by Technology Alternatives Corp. This is basically a modified EMF detector with a special mode that senses changes in the quantum flux and supposedly allows spirit energies to manipulate the unit to answer yes or no questions via the “pings” of the needle. Though I still may not be 100% certain about this device… I am now over the 90% mark for sure! … You can see it in operation in almost all of our videos through the link in my signature.